Home DANCO Roger1001 Danco (5276) - The Undervalued "Cold Stock"
Danco (5276) - The Undervalued "Cold Stock"
Dancomech Holdings Bhd (DANCO) is engaged in trading and distribution of PCE and Measurement Instruments. The Company offer its products to palm oil and oleochemicals, oil & gas and petrochemical, and water treatment & sewerage industries. The majority of its customers are from industries such as palm oil and oleochemicals, oil and gas and petrochemical, water treatment and sewerage. For now, it has a diverse customer base of 1,459 customers from various industries. The company has been reporting 3 good consecutive quarters result and their company recorded new record high profit and revenues. Their peer like UNIMECH reported 2 consecutive good quarters result too. - Supply and distribution of fluid control equipment and measuring instrument products, not involved in any production (Manufacturing) activities. Moreover, they do not have a plant. Their core product is the valve, accounting for about 70% of the overall revenue; its customers mainly on the basis of large-scale industry, including refineries, biodiesel plant, palm oil, oleochemical, oil and gas, and sewage treatment. - Valve as the national economy essential industrial equipment, machinery and equipment is indispensable to all walks of life.Its quality is good or bad in a way to give people and production safety, product quality, production efficiency and other important impact.At present, Valve is more and more widely used, the oil and gas industry has always been the largest buyers. - Although there is no any support of large number of purchase orders, but DANCO in the valve industry has more than 25 years of history, indicating that has a way to maintain the business of survival; and other pure distributors is not the same, the group has the ability to obtain palm oil industry maintenance contracts, resulting in stable income. - Driven by the steady gains from maintenance and after-sales service, and effective cost management measures, DANCO's after-tax profit has been maintained at RM10-15m in recent years; about 60%of its profit contribution comes from maintenance, repair and operational services, while the rest is from product sales, and from 3 to 6 months of short-term projects. - At FY18, its earnings have been recording new high for 2 consecutive quarters, thanks to the increased sales of fluid control equipment in the local market and in the Indonesian market, largely driven by the growth in demand in the oil and gas industry.We believe that this is likely to come from an order contribution from the RAPID project.In fact, management said earlier that the ongoing RAPID project has driven product demand higher. - Management expects demand from both local and Indonesian markets to remain good and expects to continue to deliver positive / positive results at Q4. Excluding unforeseen incidents, the DANCO group is optimistic about FY18's performance and outlook. - Looking ahead, DANCO is seeking to tap into Indonesia's Valve business and target the local palm oil industry.At present, the local palm oil plant is close to saturation, and Indonesia's palm oil plant is still in demand above supply, the development prospects are Unlimited, has a huge potential. 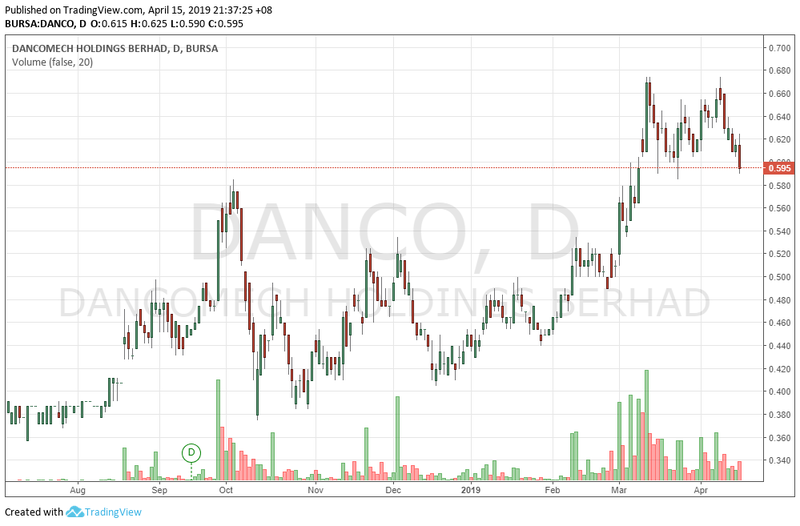 - Currently, Danco holds the net cash of RM48m, which is equivalent to 16 cents per share; it can create operating cash flow between RM10-13m each year, which can meet the capital expenditure required each year, while maintaining a stable dividend rate of 30%. - There are signs of increasing upstream activity in the oil and gas sector, both locally and in the Indonesian market. We think DANCO is very likely to hand over the good performance again in Q4, and record a new high. Danco tested twice for new high 0.675, but still unable to breakout from this level. However, this company retraced from peak 0.675 to 0.595. Strong support at 0.59-0.60 built for the past one month. This stock might have a rebound very soon. Not to forget their result on May 2019 coming out soon. Good companies usually will have a push up before result because they have high expectation on it. 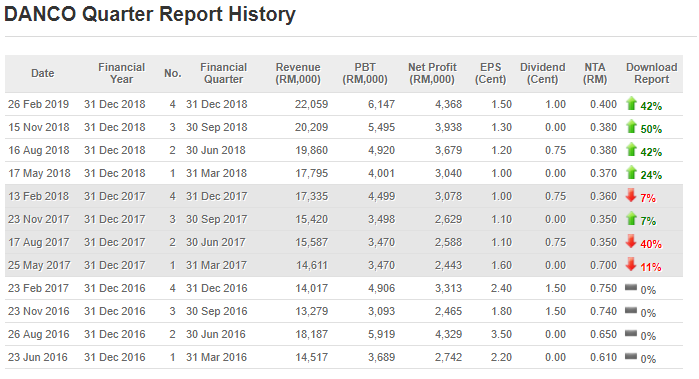 With P/E 15 and latest EPS of 1.5 x 4 = 6, this company worth at least 0.90. However, that is just a target price to be achieved in future. When market is bad, we always back to fundamental stocks that is strong enough and good growth in future. I am just an author who shares my opinion, views and general information. The comments above do not represent any recommendation of buy or sell call. Investments carry risk that you will have to bear at your own cost. I will not be held liable for any investment decisions made. Please seek for professional advice before you made any decisions.